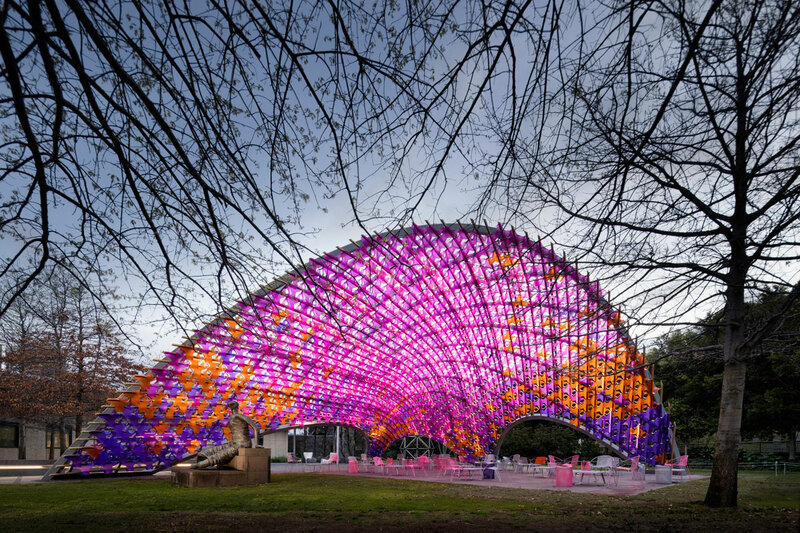 Signalling the beginning of warmer days, Australia's National Gallery of Victoria (NGV) has just opened the Inaugural Summer Architectural Commission. 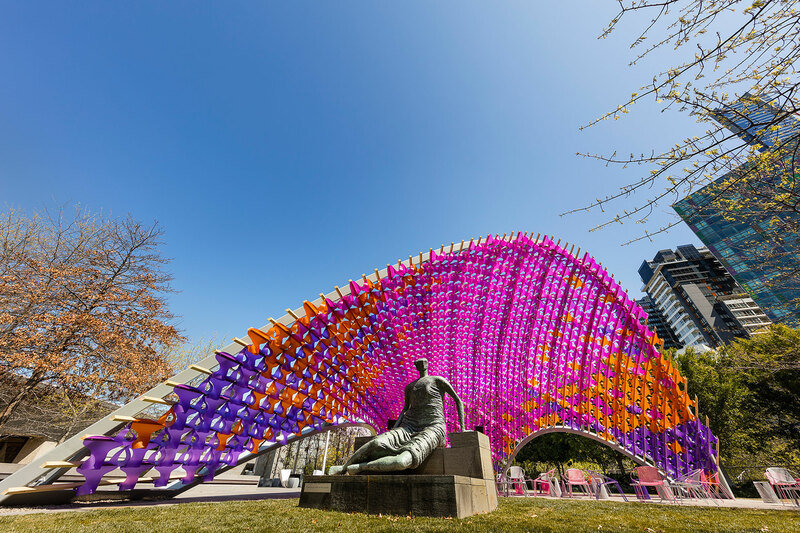 The temporary installation was designed by Australian architecture practice, John Wardle Architects, and will be the place of performance, retreat and reflection over the spring and summer period. 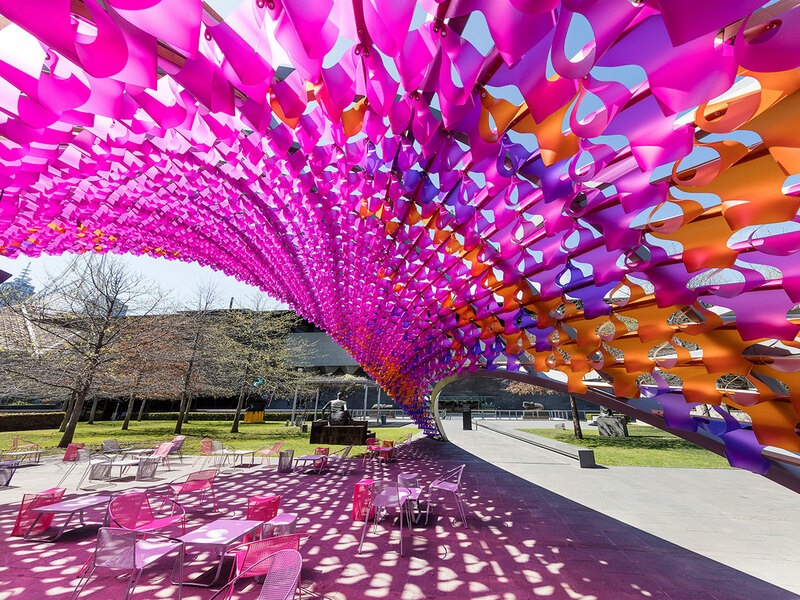 The steel structure features a canopy of vibrantly-coloured polypropylene 'blossoms' that produce an eye-catching design. The pavilion stands at 7.5m tall and spans 21m. 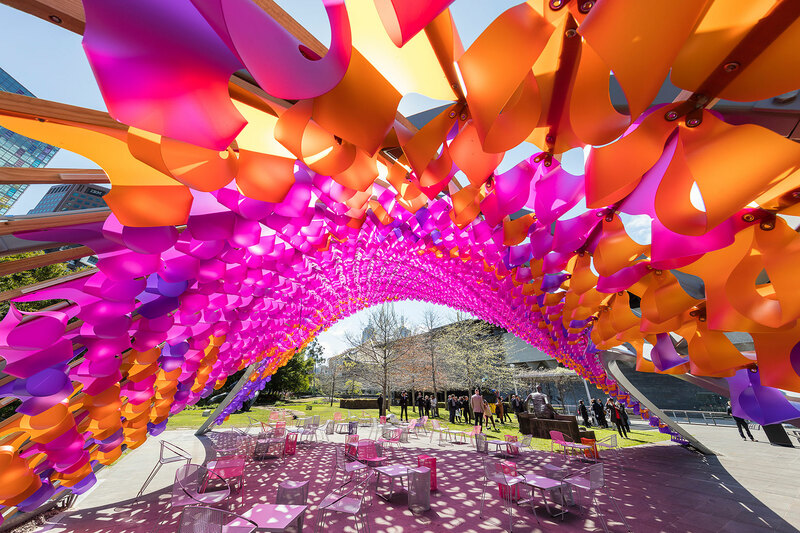 The shading system was created from approximately 1,650 die-cut, hand-folded pink, purple and orange polypropylene pieces and used 6,600 eyelets and 3,300 laser cut cleats. These shading features resonate with geometric designs seen on the ceilings of the NGV's Great Hall. The pavilion's design draws upon the poem 'I Dips Me Lid' by C.J. Dennis, which was written to commemorate the opening of the Sydney Harbour Bridge in 1932. 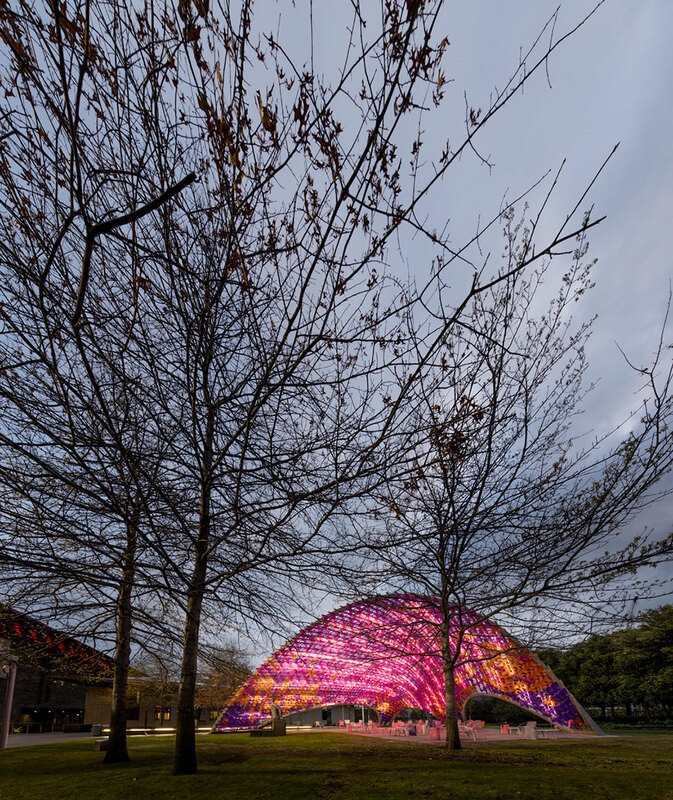 A second Sydney design reference pays tribute to the nearby Sidney Myer Music Bowl, for its elegant, innovative and energetic outdoor design of its era. 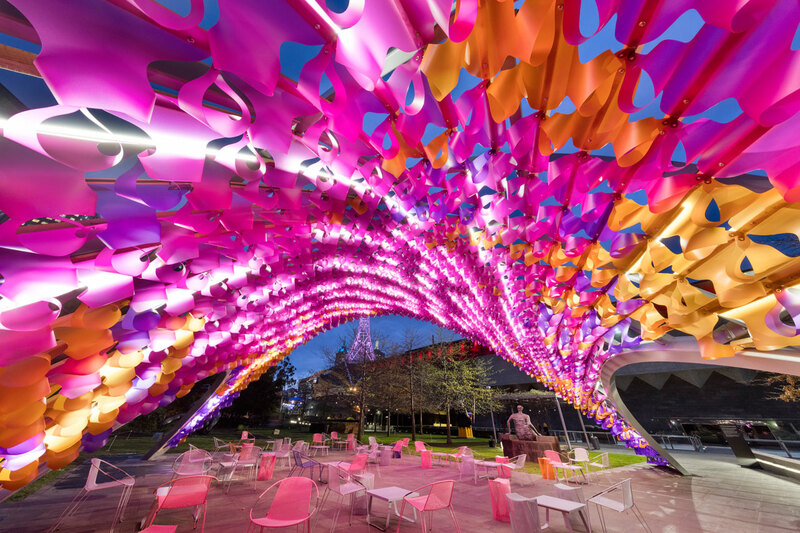 Tables and chairs sit below the awning while lighting amongst the 'blossoms' allows for day to night visits. Furthermore, the overall structure and furniture are all waterproof, catering for the occasional summer shower. 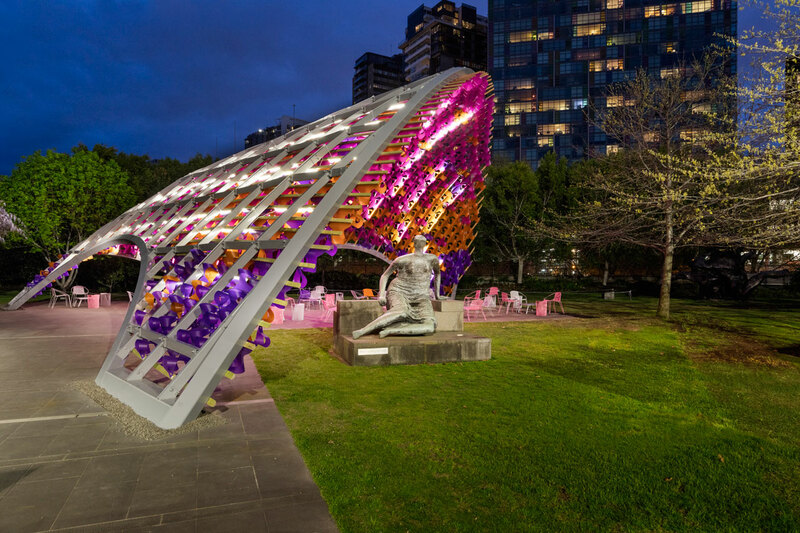 The general public will be able to enjoy the creative space as an area of relaxation and engagement at the Grollo Equiset Garden at NGV International until 1 May 2016.